Alright! 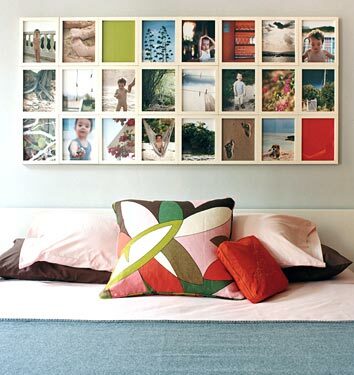 Here is another lovely idea for displaying photographs. Lots of picture frames snuggling upto each other and you have a big piece of art! Check out the pic below. 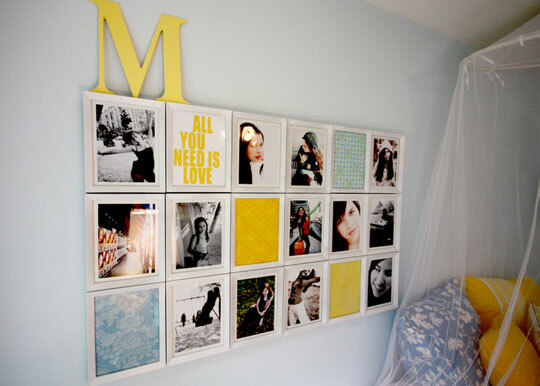 I lurve the white frames, the solid colored sheets,the patterns and the text there in. This is one pretty bedroom. Don't miss the cozy bed, the lanterns, the Big Initial and the gorgeous cushions...sigh! So many great ideas in one pic! I saw another display like this. The room is different, the colors are different and the display works so beautifully in a bedroom as well as a living room. A great mishmash of people pics, solids and nature pics! Pats: Me too! me too!